If you love all things festive but are not fond of a traditional Christmas cake, then this is the bake for you. Rich dark cacao paired with the warmth of ginger creates a bake that is sure to warm your home through from the smell as it bakes it to the minute it is all gone! Melt dark cacao, butter, dark muscovado sugar and treacle in a large saucepan with the water, over a low heat until you have a delightfully thick melted syrup. Combine the flours, cocoa, bicarb, salt, ground ginger and caster sugar in a large mixing bowl. In a jug, fork together eggs, milk and oil until combined. Pour this into the dry ingredients and stir into a thick paste. Bake in a preheated oven for 45-50 minutes, until a cocktail stick comes out with no wet batter attached to it. Allow these cakes to cool completely in their tins before turning out for decorating. 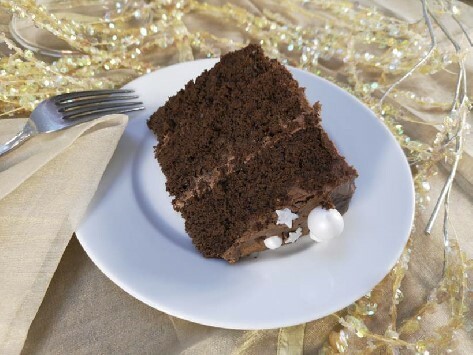 Head on over to my recipe for Chocolate Cheesecake Frosting and use this to sandwich your layers of cake together and to cover the top and sides. Aim to get the sides as neat as you can using either a large palette knife or a side scraper if you have one. 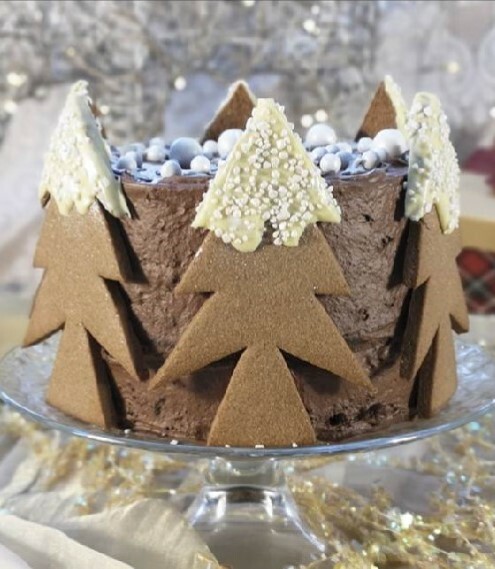 Press Cacao Chocolate Gingerbread Christmas Trees around the sides of the cake.